Home » Solutions » How to Test a Carbon Monoxide Detector? Before indication error detection of the alarm, the zero-point and indication of the instrument should be first calibrated. After getting connected with the electricity, the instrument should be, after preheating, stabilized and then have the highly-pure ammonia gas for debugging of the zero point. Then, connect the standard material pipe of the gas with the instrument’s inlet part. Inject the standard gas whose concentration is around 1.1 fold as much as the limit of the alarm for calibration. Following that, inject the standard gas in accordance with the user manual. If there are no requirements specified in the user manual, the flow should be controlled within the scope of (200±50) mUmin. Regulate the instrument indication to be consistent with the standard value. Repeat the operation until the indication is steady. 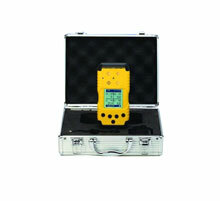 Third, in order to obtain a steady detection data, the low-concentration gas should be first injected . Then, use 36µmol/mol、300µmol/mol and 700µmol/mol standard gas for verification, respectively. Finally, calculate the basic error, and judge whether the instrument detected is qualified. Response time refers to the time required by the carbon monoxide gas detector's indication to rise from zero to 90% of the set steady indication. In this case, 700µmol/mol standard gas is used for three detections. Meanwhile, the gas quantity pumped into should be steady and at an even speed. Meanwhile, after every measurement, the carbon monoxide detector's indication must be reset to zero. The alarm should respond within 60s. Debugging of the response time is very important. First, pump into the zero-point gas. After the zero point stabilizes, pump into the 700µmol/mol standard gas, and read the first steady indication. Then, pump into the zero-point gas until the zero-point is steady again. Pump into the 700µmol/mol standard gas. At the moment, launch the second counter. When the indication rises again to 90% of the first steady indication, put down the display of the second counter, which is the response time. Repeatability is a quantitative index to measure the degree of diffusion of results measured by the alarm. The smaller the value of repeatability is, the more concentrated the measurement results of the instrument are, and the higher the sensitivity of the carbon monoxide gas detector is.